adult migrants and their health/immunological status. This project brings together evidence from institutions (including medical and welfare), registrations of deaths and cause-of-death statistics to provide a continuous overview of the long-run pattern of urban life chances in Britain. 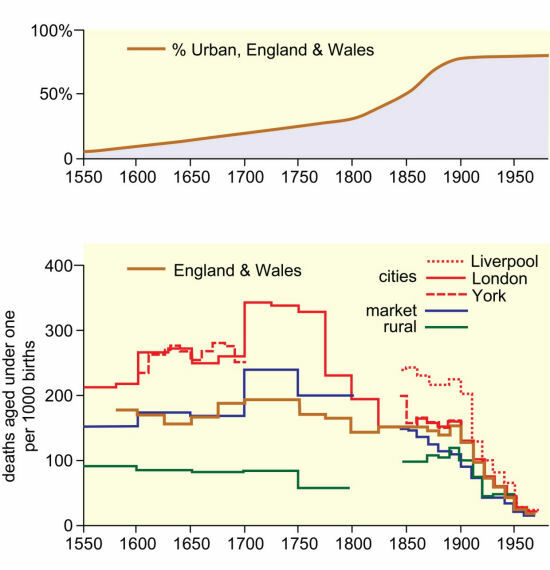 The experiences of other European and North American populations will also be employed to elucidate the extent to which towns were drivers of epidemiological change during the first demographic transition, and the differing roles of health and welfare provision, industrialisation and migration in these processes. This is a project of the Demography, health and wellbeing research theme, part of the Vital Geographies thematic research group, and The Cambridge Group for the History of Population and Social Structureresearch group, part of the Cambridge Cultural and Historical Geography thematic research group.